BCBGMAXAZRIAGROUP has partnered with Elizabeth Arden to launch a new fragrance, BCBGMAXAZRIA bon genre, a seductive scent with an alluring air of mystery and a kick of attitude for today’s confident, sophisticated woman. The third and final fragrance of the BCBGMAXAZRIA Fragrance Collection, BCBGMAXAZRIA bon genre adds a glamorous edge and rounds out the portfolio with a fragrance for the ingénue in every woman. Created on the heels of the successful 2012 launch of the feminine and decidedly pretty, BCBGMAXAZRIA bon chic and the playful signature BCBGMAXAZRIA fragrance in 2011, bon genre completes the dynamic BCBGMAXAZRIA fragrance collection. “I set out to create fragrances that would have meaning for the many facets of the BCBGMAXAZRIA woman,” said Lubov Azria, BCBGMAXAZRIAGROUP’s Chief Creative Officer. “As the third and final piece of the Fragrance Collection, BCBGMAXAZRIA bon genre is an exploration of her darker more mysterious side and brings an effortlessly cool sensibility – with attitude – to the collection.” BCBGMAXAZRIA is committed to creating sensuous and sophisticated fragrances that make women feel confident and beautiful, designed to embrace individuality and transform the mood of the wearer. With a steadfast attention to quality and development, the BCBGMAXAZRIA fragrance collection fits seamlessly into the lifestyle of the dynamic woman. Always on the forefront of fashion, BCBGMAXAZRIA is the premier lifestyle collection for the dynamic woman. Fusing creativity, accessibility, desirability and wearability, BCBGMAXAZRIA occupies a unique position in the American fashion marketplace, offering sophisticated, confident designs that take consumers from work to the weekend in style. A seductive scent with an alluring air of mystery – bold notes of Lychee, Red Berries, Bergamot and Black Pepper ORPUR®, result in a kick of attitude and a vivacious fashion energy. 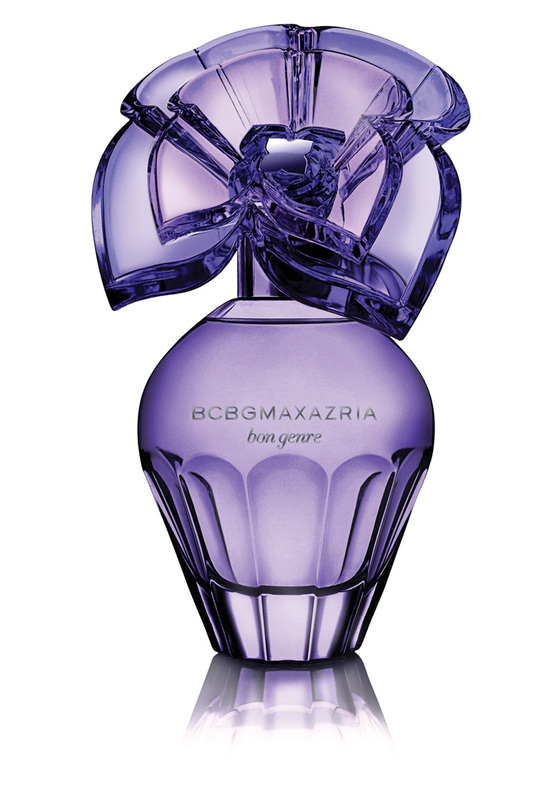 The opulent purple fragrance bottle mirrors the shape of the signature BCBGMAXAZRIA fragrance collection style, designed to resemble hourglass curves with the brand’s iconic butterfly logo that has transformed into a blooming flower on the cap. BCBGMAXAZRIA bon genre will be available at Sephora September 2013. For more information, head to Elizabeth Arden on Facebook, Twitter, Youtube and Pinterest!